In 1964 The Strode Publishers of Huntsville, Alabama, released Treasured Alabama Recipes by Kathryn Tucker Windham. A great success, the book’s recipes were accompanied by stories that caught the public imagination. Strode was eager to have another book by Windham, stories this time, no recipes needed. 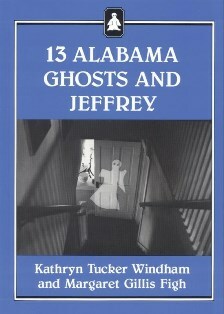 Windham chose to write up ghost stories from around Alabama, collaborating with folklorist Margaret Gillis Figh of Huntingdon College in Montgomery. Windham did text and photographs; the very attractive woodcut illustrations were done by Delores Eskins Atkins. It wasn’t only Jeffrey, either. Over the next few years there were six more “ghost” books—ghosts of Mississippi, Tennessee, etc.—and a compilation ghost book from NewSouth Books. The six together have sold over 100,000 copies, an official at the UAP tells me; Jeffrey accounts for fully half of those sales. These books were really popular, so much so that a librarian in Selma is reputed to have complained that Jeffrey was the library’s most stolen book! Copies just keep flying off the shelves. Not surprisingly, over the next few years the University Press will be re-issuing the ghost books in hardcover format, culminating in a boxed set of six. Windham died in 2011, and this present edition, a facsimile of the hardcover original, includes two new afterwords, one by Ben and one by his sister, Dilsy. As if all of this were not enough, Jeffrey seems to have posed for a picture or at least appeared in one in the Windhams’ living room. The photo is included in the volume for your inspection. Jeffrey’s story is not told here. However, thirteen other ghost stories are. John McGee Parkman was president of First National Bank of Selma; during Reconstruction, he speculated with the bank’s funds in cotton, lost heavily, was arrested, escaped, perhaps drowned in the attempt, and then returned to Sturdivant Hall. Other people have SEEN Parkman, but the pretty docents feel his touch. Several of the ghosts left this world violently and so remain angry and restless. In Dale County, Bill Sketoe was unjustly hanged. The spot beneath his dangling feet is haunted. The anguished face of Henry Wells, also unjustly lynched, still stares down from the courthouse attic window in Carrollton. As is only reasonable, ghosts favor mansions, and the most distinguished Great House in Alabama, Gaineswood, outside Demopolis, has its resident spirit. Evelyn Carter of Virginia was the sister of the widowed General Nathan B. Whitfield’s housekeeper. Evelyn was invited to spend winters at Gaineswood to keep her sister company. She and Whitfield would play duets, Evelyn on piano and the general on bagpipes! All was well until Evelyn died of malaria or pneumonia or perhaps a broken heart, and since it was winter and roads were icy, her body was stored in an airtight pine box under the stairs in the cellar until spring. It seems Evelyn took offense. Residents at Gaineswood heard footsteps, then piano music. Evelyn’s body was taken to her native Virginia and buried, but she stayed angry. “Evidently Evelyn could not forgive them for keeping her so long under the stairs in the cellar,” writes Windham. There’s a lesson here somewhere. Perhaps the physically largest apparition is the steamboat Eliza Battle, burned on the Tombigbee in February 1858, “[t]he greatest tragedy in Alabama’s river history.” Sometimes people see the whole steamer “rise up out of the troubled water” ablaze, victims shrieking, with the band playing. Children have loved these stories for decades, but it would be best to read them in the daylight, not at bedtime.